This section brings you exclusive welcome bonuses, free money (no deposit bonuses) and free spins from the best UK online casinos. We’ve teamed up with various casinos to give you exclusive offers only found here at CasinoManual.co.uk. You can click through straight to casinos right away to get your exclusive deal but if you want more information, be sure to check out the detailed casino reviews – enjoy! Deposit just £10 to get 50 free spins with no wagering requirements to use on any Age of the Gods video slot from Playtech. Deposit using your debit or credit card only. Why Play at NetBet Vegas? Sign up & deposit at NetBet Vegas to get a 100% bonus up to £200 – you will also get up to 200 NetEnt free spins on your 1st 3 deposits. 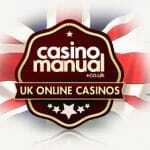 CasinoManual.co.uk readers can get an exclusive 150% bonus up to £300 – deposit £200 to get the full £300 free. Once you deposit, you will get 25 free spins on Fortunes of Sparta. Sign up at Vera & John to get an exclusive 200% bonus up to £100 plus 100 bonus spins once you deposit. There’s also bonuses on your next 3 deposits. CasinoManual.co.uk readers are welcomed by Mr Green Casino with 20 no deposit free spins on Motörhead – all you need to do is sign up at Mr Green! Then, there’s a 100% match bonus up to £100 as well as 100 free spins on the Marvellous Mr Green slot after your deposit. Why Play at ComeOn Casino? Sign up at ComeOn Casino to get 20 Starburst free spins right away. Then there’s an exclusive 100% bonus up to £200.